Home to Africa's second largest refugee population after Uganda, Ethiopia hosts more than 900,000 people who have fled conflict, drought and persecution in neighbouring countries such as South Sudan, Sudan, Somalia and Eritrea. The refugees - many of whom sought refuge decades ago and have children born in Ethiopia - are largely confined to one of about 20 camps across country. Most are not permitted to work. 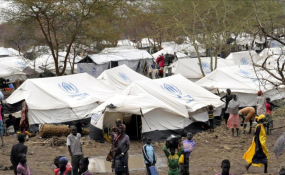 "We are happy to inform that the new refugee proclamation has been enacted by the House of Peoples' Representatives of the Federal Democratic Republic of Ethiopia," Ethiopia's Administration for Refugee and Returnee Affairs (ARRA) said. "It is strongly believed that the new law will enhance the lives of refugees and host communities," added the statement posted on ARRA's Facebook page. The new law is in line with Ethiopia's commitment towards the United Nations Global Compact on Refugees, adopted by world leaders in December to increase refugees' self-reliance and ease the pressure on host nations. The head of the Ethiopian Investment Commission Fitsum Arega said the new legislation was part of the country's "Jobs Compact" - a $500 million programme which aims to create 100,000 jobs - 30 percent of which will be allocated to refugees. "This helps refugees & supports #Ethiopia's industrialization," said Arega on Twitter. "As some Western countries have adopted xenophobic policies while turning away refugees, we are pleased that Ethiopia has passed this revised refugee law," said Stine Paus, Country Director for the Norwegian Refugee Council in Ethiopia. "The law will help refugees feel included and that they can contribute to society," said Dana Hughes, spokeswoman for the United Nations refugee agency in East Africa. "But we must remember that access to education and employment doesn't just benefit refugees, it also contributes to the economy and benefits local communities. Such legislation isn't just the right thing to do, it's the smart thing to do."